SAP’s Innovation Center is the epitome of new ideas, learning, and knowledge sharing. It is home to over 60 IT professionals from across the world. Topics such as Conversational AI, Machine Learning, Blockchain, and Quantum Computing among others are venerated. With the general hubbub of customer visits, development activities, cross-team collaboration, it’s hard to escape the palpable energy and excitement clouding the ICSV. So, what does an immersive, knowledge-sharing workspace look it? The Innovation Center was built to act as a hybrid for inclusivity, and technology. The open-plan format was deliberate and meant to be an antidote to traditional, cubical and confining workspaces, according to Sajid Saiyed (Head of UX Design, ICSV), who helped with the renovation of the offices late last year. The open space promotes creative exchanges, increased productivity and stimulates innovation in a modern setting, he explains. It’s also great for listening in on hilarious exchanges, just kidding. The team knew exactly what sort of space they wanted to design from the get-go. They wanted to create a space that allowed natural light, transparency across the floor, with a visually appealing scheme and comfort. The devil is in the details – the couches, the sofas, the color scheme, and layout have a complementing effective. The high tables, the game room, and telephone booths are also befitting of the Innovation Center. The common areas, such as the kitchenette, encourages spirited conversation, bonding, and the perfect place for weekly pizzas and potlucks. But also, this is a space that enables brand perception and serves as a reflection of “who we are and what we do”. No doubt if the walls at ICSV could speak, they’d tell you stories of technology. Well, they kind of do. 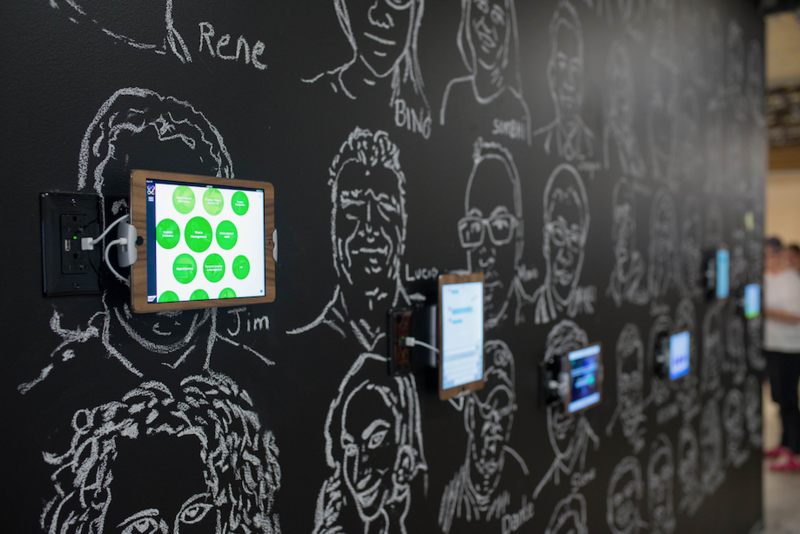 The interactive iPad wall features brand stories and allows visitors to have a tête-à-tête with chatbots while the second wall showcases the talented members of the team in chalk drawings. This wall of faces is a wonderful tribute to the team, their culture, and heritage (spanning all seven continents) and works as a great introduction to “new faces”. A similar wall showcases the many projects helmed by ICSV as well as a location of sister Innovation Centers around the world. 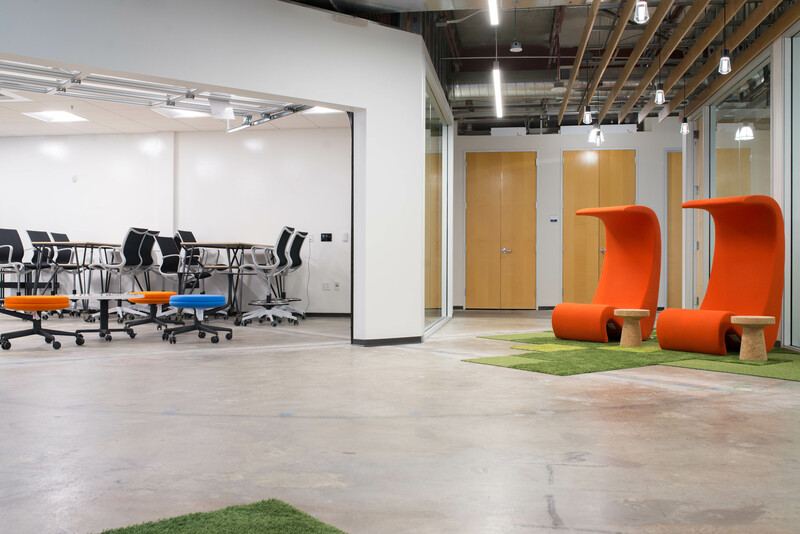 Because this is Silicon Valley and garages are revered here; when it came to designing a collaborative workspace, a room for workshops and team meetings, Wafaa Sabil, Senior UX designer, knew exactly what was needed. A Steve Jobs inspired garage right in the center of the offices complete with an electric, glass door, minimalist walls, and high glass windows – another nod to transparency. It’s also the teams’ way to honor the heritage of Silicon Valley, the start-up culture and the technology it’s famous for.